Unless stated otherwise, all items listed are priced with shipping IN THE USA ONLY. Preferred payment by check, money order or PayPal. Checks may be held for 10 days for clearing. RCA Victor Company produced the trademark fabric for stores. The material was used as drapery and curtain material or as a backdrop. 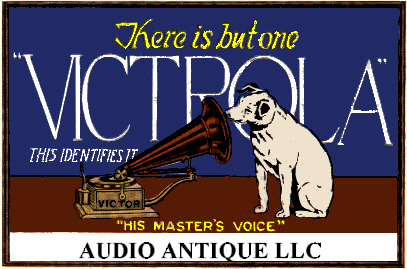 The fabric panel below features the round RCA Lightning Bolt "meatball" logo as well as the famous "His Master's Voice" trademark logo. We are located in northeast Wisconsin near the city of Appleton. Here you will find Wisconsin cheese, the Green Bay Packers, brats, beer and some very nice antiques. AUDIO ANTIQUE LLC maintains a space in the FOX RIVER ANTIQUE MALL. We stock an array of phonograph and Nipper accessories along with cylinder and disc wind-up phonographs and records. Other Victorian antiques and collectibles will also be found. We are always looking to purchase fine quality antiques, phonographs, and collectibles. If you are traveling through northeastern Wisconsin, we invite you to visit one of the finest antique malls in the area with over 165 dealers. OUT FOR A DRIVE, OR TRAVELING THROUGH WISCONSIN? A clear choice is this 3" solid glass figure made in the 1980's by the Fenton Glass Co. as seen on Page 5-49 of Nipper Collectibles, Vol I authored by Joan & Robin Rolfs. $59.00 incl. shipping in USA. Matches from Behm Electric of Lomira, Wisconsin were a popular advertising item when smoking cigarettes was cool! The Nipper logo is on the cover of the matchbook. This RCA service pin was given to dealers. It measures 3/4"x7/8". Stunning cloisonne workmanship.Found on page 3-81 of Nipper Collectibles, Vol I by Joan & Robin Rolfs. Brass key ring with Nipper and the gramophone logo. Measures 1-1/4"x1-3/4". Circa 1990. Gramophone surrounded by holly with "Christmas Wishes." Design is lightly embossed on the card. Card is in good condition. Slide the 15 square pieces around and create the famous "His Master's Voice" trademark. The red puzzle features the contemporary RCA logo outlined in black. The lower puzzle features the traditional trademark as painted by Francis Barraud. Never used, each measures 3-1/4"x2-1/4". See them on page 5-20 of Nipper Collectibles Vol I by Robin & Joan Rolfs. The blue fabric panel shown above has an earlier design circa 1930-40s. This panel measures 80"x22". More information on Nipper logo curtains can be found on page 3-78 in the Nipper Collectibles Vol I book by Robin & Joan Rolfs. Beautifully crafted Nipper and the gramophone key ring. Measures 2"x1-3/4". Circa 1998 as seen on page 5-39 in Nipper Collectibles Vol I. An ornate 1-3/4"x1-1/4" fob with the HMV logo. Old and marked "sterling" on the back. Seen on page 2-78 in Nipper Collectibles Vol I by Joan & Robin Rolfs. M.R. McMillion of McComas, W. VA had metal fob medallions made to advertise his company. The 1932 RCA lightning bolt combined with the HMV logo dominate the design on the face of the metal. The fobs came in two colors: Golden brass (above) and Silver gray (below). See page 3-69 of Nipper Collectibles Vol I by Joan & Robin Rolfs. Please specify which medallion color you wish. In 1913, the Victor Talking Machine Co. produced the Victor XXV referred to as the "Schoolhouse Victor". Designed for schools and educational institutions, it was a large outside horn machine. An accompanying catalog of records titled: "A Graded List of Victor Records for the Home, Kindergarten and School" featured catagories of recordings suggested for various grades and age groups as well as subject areas. This comprehensive book measures 7-1/4"x5" and contains 280 pages! Throughout the catalog are photographs of school classroom settings of 1920 depicting the Victor XXV being used for educational purposes. Captioned photos show highschool classrooms from across the country. This is a great resource illustrating music appreciation in early 20th Century classrooms. Minor wear as shown. A 7/8" plastic tac of Nipper outlined in black.